Every girl dreams about the day she’ll be wearing her long puffy dress and having her hair & makeup done by professionals for the very first time. You may be feeling nervous because you don’t know what your reaction will be as soon as your final look is revealed in front of the mirror. To avoid unpleasant surprises on your quince day, you must try the following quinceanera makeup ideas according to the color of your dress! There are tons of makeup looks for this color but to stay on the safe side, add a hint of pink to your eye shadow and blend it with black and gray. If you decide to wear a bright pink lipstick, you must opt in for a neutral brown eye shadow. Click here to purchase dress by Morilee! Just because you decided to wear a blue quinceanera dress doesn’t mean you need to immediately apply blue eye shadow. Only certain people are able to pull off blue eye shadow anyway (mainly girls in dance recitals and supermodels with unique facial features). Instead, choose a brown color palette and if you must apply blue do it at the inner corner. Complete your look with a neutral pink lipstick. Lilac or plum eye shadow works best for a purple quinceanera dress depending on the shade of your dress. If purple eye shadow is too intense, you can never go wrong with a brown smokey eye. 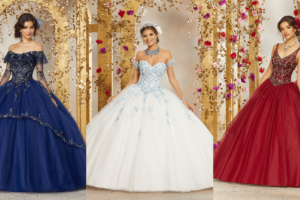 You have to be very careful with your makeup if you choose a red quinceanera dress because if you don’t plan carefully, you might end up looking like a hot mess. Red lipstick must be worn with a neutral eye shadow and winged eyeliner at the most. For more conservative chicas, a subtle eye shadow and neutral lips will be your best bet. You definitely need to choose a brown eye shadow with gold accents! Finish off your makeup look with a black eyeliner and mauve lips for added drama. If you go for muave lips, keep everything very subtle including your blush. For your bold Quince dress to stand out, you want a natural glam with either silver or gold slightly included. For a bronze appearance, be sure to add on some bronzer and a shimmery highlight that will enhance your features.